We spoke to one of our teachers Neil Root about why he enjoys teaching at Rose of York, what inspires him as a writer, and why London is the perfect place to learn English and learn about British history and culture. Neil has been teaching English for 16 years in London and abroad, and at Rose of York teaches General English, Business English, Cambridge and IELTS exam classes, Academic and Creative Writing and Conversation classes. He has published seven true crime books including Crossing the Line of Duty (2019- nominated for the prestigious CWA Gold Dagger Award for Non-Fiction) The Murder Gang: Fleet Street’s Elite Group of Crime Reporters in the Golden Age of Tabloid Crime (2018-nominated for the CWA Gold Dagger Award for Non-Fiction), Gone: The Disappearance of Claudia Lawrence (2013), Frenzy! How the Tabloid Press Turned Three Evil Serial Killers into Celebrities (2012) and Twentieth Century Spies (2010). He writes crime news and feature articles for national newspapers and magazines and contributes to true crime documentaries. 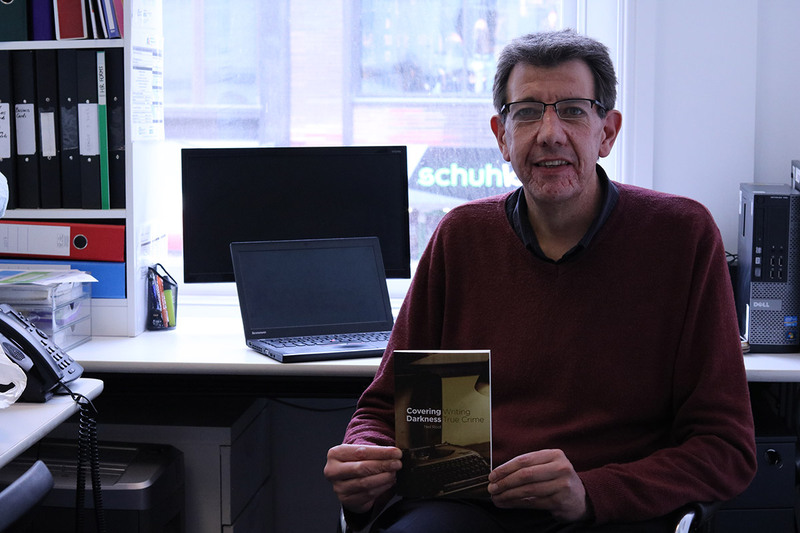 He has also published three works of literary criticism focusing on the works of classic writers Aldous Huxley, James Baldwin and Truman Capote, and his latest book Covering Darkness: Writing True Crime (2019) analyses the genre and the best true crime writers. What do you like most about being an English teacher? I genuinely enjoy teaching and helping students learn to help them fulfil their dreams and ambitions. It’s a creative job and I like delivering lessons to give students what they need. I also love meeting people from different cultures, ages and backgrounds- it is never boring! There is nothing better than seeing a class happy and focused, and seeing people improve gives me a lot of satisfaction. It doesn’t matter if you are a child, teenager or adult- any age can improve their life and prospects by learning English. Why do you like teaching at Rose of York? It’s a great school- the teachers, staff and students have a good relationship, and there is a great atmosphere- I would honestly recommend it to anybody thinking of coming to study in London, whether for a few days, weeks, months, or even a year. There are lots of social activities arranged for the students, very friendly management and reception staff who really care about students, and the teachers are all experienced and genuinely love what they do. It’s also in a perfect location, right in the very centre of London, where all the excitement and famous places and sites are, plus great cafes and restaurants from all over the world. The English writer Dr Samuel Johnson (who wrote the first English dictionary in London) said that “A man who is tired of London is tired of life.” I agree with that- I have visited many cities, but London is still the most exciting for me- although I was born here, it is my hometown, so I may be biased! In London you are surrounded by history- just metres from Rose of York school is on Oxford Street, where the poet Lord Byron was born (it’s now a department store! )- just a little further down near Bond Street (a very expensive shopping area) you can see where the great guitarist Jimi Hendrix lived- he lived next door to the classical composer Handel, but of course Handel lived there many years earlier! You are also surrounded by places where murders and mysteries happened, political conspiracies were born, and infamous gangsters and spies met and lived. And just metres from our school you are in Soho, and you can see where Mozart lived, Marconi stayed, and where John Logie Baird first demonstrated television. You can also drink great Italian coffee and eat delicious Chinese food there in Chinatown, and cuisines from all over the world. And just a short walk away, you have all the best shops, many museums (most of them free), Leicester Square (the home of film in London), the National Museum, the National Gallery, Big Ben, the Houses of Parliament, the London Eye, and fantastic bars and clubs- and by taking the tube or bus the whole city has so much more in many districts. Is it good for students to live in a city where everyone speaks English? Yes- it is the best way to pick up English and fast. When you are surrounded by the language every day, you have no choice but to engage with it, and students begin to speak English more and more until it becomes natural, and then automatic. In class, we focus on both accuracy and fluency in speaking, reading, writing and listening, but in your life here every day you can improve your fluency and practice your accuracy everywhere. It’s about confidence, and the more confident you are, the better you will use English for life, study and work. I wanted to be a writer from about the age of sixteen, I don’t know why! But it is my passion and I love doing it- it kind of choose me- what we call in English having ‘a vocation’- something that you need to do. I started writing poetry, then a play and then novels, but didn’t get them published, and then I realised that creative non-fiction was the genre for me. I can be creative, but I find the truth fascinating- we say in English that fact is often more interesting than fiction, and I personally agree with that. I am inspired by mysteries, history, and the psychology which makes people do strange and bad things. That’s why I write true crime, which is about real crimes, and I try to bring them to life for readers. I also love literature, from many countries, and I write critical studies of other writers too. I love writing because I also love reading- books can take you into a different place, and of course reading is the best way to improve your English vocabulary! Do you enjoy being both a writer and teacher at the same time? Yes- it is the perfect balance for me. When you are researching and writing, you often spend a lot of time alone (except for when you interview people). Teaching gives me social interaction, and with so many kinds of people and cultures- this works very well for me, and my students often give me ideas, as they are often very creative people. I love to teach writing too- both creative and academic writing- and I often use literature in class when I am teaching- good writing introduces and deepens understanding of English-speaking cultures for students, as writers mirror the society in which they live and work.